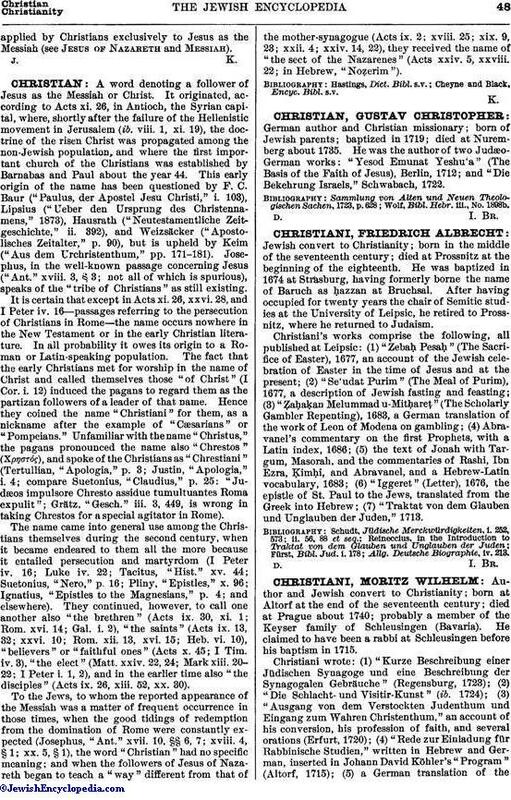 Jewish convert to Christianity; born in the middle of the seventeenth century; died at Prossnitz at the beginning of the eighteenth. He was baptized in 1674 at Strasburg, having formerly borne the name of Baruch as ḥazzan at Bruchsal. After having occupied for twenty years the chair of Semitic studies at the University of Leipsic, he retired to Prossnitz, where he returned to Judaism. Christiani's works comprise the following, all published at Leipsic: (1) "Zebaḥ Pesaḥ" (The Sacrifice of Easter), 1677, an account of the Jewish celebration of Easter in the time of Jesus and at the present; (2) "Se'udat Purim" (The Meal of Purim), 1677, a description of Jewish fasting and feasting; (3) "Ẓaḥaḳan Melummad u-Mitḥareṭ" (The Scholarly Gambler Repenting), 1683, a German translation of the work of Leon of Modena on gambling; (4) Abravanel's commentary on the first Prophets, with a Latin index, 1686; (5) the text of Jonah with Targum, Masorah, and the commentaries of Rashi, Ibn Ezra, Ḳimḥi, and Abravanel, and a Hebrew-Latin vocabulary, 1683; (6) "Iggeret" (Letter), 1676, the epistle of St. Paul to the Jews, translated from the Greek into Hebrew; (7) "Traktat von dem Glauben und Unglauben der Juden," 1713. Allg. Deutsche Biographie, iv. 213.